My daughter is an organizer. We love to clean out drawers and rearrange things. 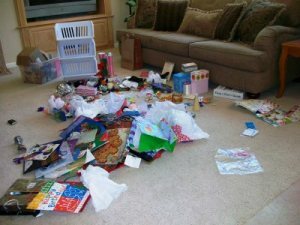 So when she told me yesterday that she wanted to clean out our gift closet (where we keep wrapping paper, gift bags, bows, etc. ), I was thrilled. I thought it’d be a great little project. “This is the way I clean,” she said proudly. “Well, I hope so, because I’m not picking that up,” I told her. An hour later, she was still sitting in the middle of the pile, tired of playing with bows and ribbons and gift accessories. Thirty minutes later, only half the room was clean. LOL, she is so sassy! LOL! My girls love to organize as well. But I know how that feels to dump everything out and think…..oh no! Oh my gosh…that is the cutest thing I've read!!!!!!! LOL! Too funny. She's got a great sense of humor. Well doesn't she just have the best attitude ever! I love her song. That is just the kind of thing I would do.So did she finish cleaning all that up?! That is just the cutest little story! So adorable!!! I loved how you both 'delighted' in the best mess ever…and the curtsy is priceless!Do we get to see the finished bins? :)Great to find you here Genny! LOL! Funny how we all do things differently, but good for you for having her take responsibility. :-) She sounds cute! What a cheery outlook when you're knee deep in "stuff"…I could use her help! What a funny story! Did she find any treasures as she was organizing? Ha! That's cute! I have those same bins in my closet and I am always amazed at how much stuff I can cram in, I mean neatly put away! We just attempted some of that organization stuff in our house too. Attempted being the key word! That is too cute!! Stopping by from SITS. Have a great day! what a cute story…for us…not for you, so much! I just think it's funny that you actually have a closet dedicated to gift-wrapping…and I've seen some pretty fine messes in my day, but yours is one of the prettiest. What a smart & sassy cutie! Did you clean it up? I am not a huge fan of organization. . . Unfortunately, my girls mess up their rooms, and then we just close the door. I'd really be afraid to turn one of my gals loose on a project like that…but I love your little girl's song! Well, if you are going to have a mess, you could do much worse than pretty ribbons and bows! Glad to see you back… missed your site!! I have had that feeling many times with my brood usually when cleaning their bedrooms!Your daughter is so playful and witty too!! I wish I had one that picked up. My boys are all allergic to cleaning. I hope it's just a stage.Thanks for stopping by my blog. great story…this is the method my litle girl uses! thanks for stopping by my blog today! I love that she cleaned it up and sang about it even after saying she didn't want to. And anything that keeps a kid busy that long sounds good to me!